We love CANDIDS! They are the best possible way for a photographer to capture the depth of emotion at any moment of the day! In addition to that, working with the available light or natural light to give the image the beauty that nature intends is something else we love to do. Our background in fine art photography lets us see things a little differently from many other photographers, giving us the ability to make works of art that reflect your true personality and outlook on life. Also because of our fine art photography experience, we are more than comfortable working with monochrome or black and white images, in fact, we sometimes “see in black and white,” giving you amazing, timeless but at the same time, cutting edge photographs for you to display proudly. We were thrilled to be invited to photograph Victoria and Abel at their spectacular but intimate wedding at the Prado in Balboa Park in San Diego. 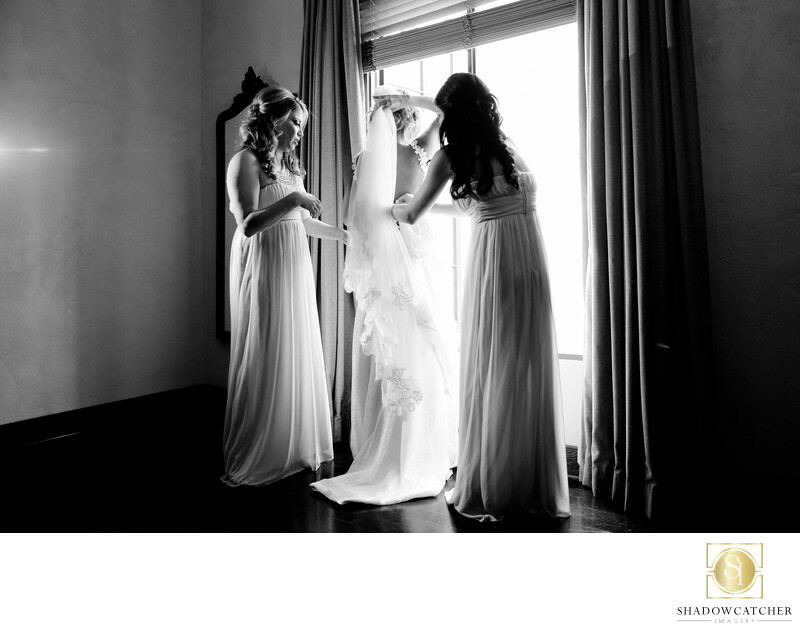 This particular image was shot in the bride’s getting ready room at the Prado, with two of Victoria’s bridesmaids assisting getting her into her dress. The light from the window overlooking Balboa Park gave it a beautiful glow. As San Diego based wedding photographers, we love working at the Prado and any of the other beautiful spots in Balboa Park! The Prado at Balboa Park is a National Historic Landmark which was originally built for the 1915-16 Panama-California Exposition. This two year festival was held in Balboa Park to promote San Diego and to celebrate the 1914 opening of the Panama Canal. In 2000, The House of Hospitality reopened after a complete reconstruction and modernization. The 3-year renovation restored the building’s architecture, artwork, sculptures, alcoves, gardens and fountains. Every effort was made to historically renovate the House of Hospitality in keeping with its original Spanish, Moorish and Mexican architectural design. This is evident in over two dozen, original, hand-painted, wooden stencil designs on doors as well as the intricate hand stenciled ceilings and beams. The Donal Hord sculpture, “Women of Tehuantepec” still remains in the fountain of the building’s restored central courtyard. The renovated House of Hospitality features lush historical gardens and a courtyard, elegant banquet rooms, romantic terraces and the outdoor grandeur of the historic Casa Del Rey Moro Gardens. The Prado at Balboa Park offers more than 22,000 square feet of indoor and outdoor event space and can accommodate groups of 20-20,000 guests.